This is the homepage of abctab2ps by Christoph Dalitz. I am grateful to the German Lute Society for hosting this site. 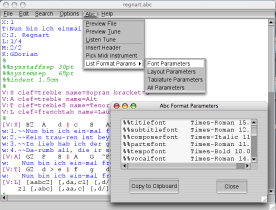 abctab2ps is a music and tablature typesetting program which translates an input file in the abc language into postscript. It is based on Michael Methfessel's program abc2ps. 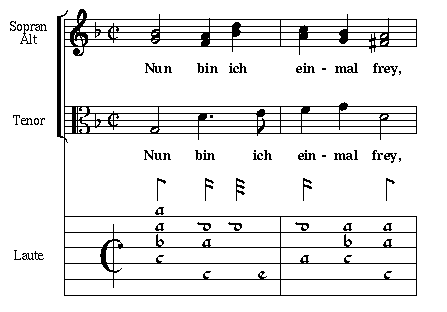 While abc2ps can only typeset music, abctab2ps is an extension by Christoph Dalitz that can also handle lute tablature. flabc is an editor that can be used for writing abc files. The prefix "fl" is an allusion to the FLTK programming library which is used by flabc. additional tool for extraction of voices, movements etc. abctab2ps and flabc are copyrighted by Christoph Dalitz and can be distributed freely under the terms of the GNU General Public License. start a text editor, enter the music in abc language and save it under a filename with the extension ".abc", eg. "bla.abc"
switch to the command line and call abctab2ps on that file, eg. "abctab2ps bla.abc". This will create the score as postscript graphics in the file "Out.ps". The generated postscript file can be viewed on the screen with a postscript previewer like gv or sent to the printer with lpr. Alternatively you can use flabc which integrates all three steps within an easy to use graphical user interface. Important Notice: abctab2ps is not bug free. In particular there might be buffer overflow bugs which can potentially be harmful. Thus you should not run abctab2ps under a superuser account and always have a look at the contents of unknown abc files before running them through abctab2ps. See the question "Can abctab2ps do any harm to my system?" in the FAQ document. The detailed User's Guide describes the abc language and is essential for step 1. There is both a postscript version (for print out) and a HTML version (for online reference). Moreover there are some illustrative examples in the abctab2ps package. The manual page describes the invocation of abctab2ps and all command line parameters. It is essential for step 2. There is both a postscript version (for print out) and a nroff version (for online reference under Unix). The documentation for using flabc is accessible from its main menu item "Help/Flabc Documentation". An online version can be found here. Example files can be found with the menu "File/Load Example". The HTML version of the abctab2ps user's guide can be also browsed here and here is a PDF version for print out. Answers to frequently asked questions about installation and usage of abctab2ps can be found in the FAQ document. Recommendations for postscript software and editor alternatives to flabc are given in the section References. If you want to compile the abctab2ps source code, you need an ANSI C++ compiler with STL support. For compiling the flabc source code you need additionally the FLTK C++ GUI toolkit. The binaries provided on this site have been compiled with gcc on Linux and MacOS X (gcc is shipped with Xcode) and MingW32 on Windows. If you want to know what's new in the latest version of abctab2ps, please read the latest release notes. Which version you download will depend on your operating system. For an installation unpack the archive with a double click in the Finder and move the application where you like. You can drag and drop abc files on the application. Note that you will additionally need a postscript viewer; see the menu "Help/Flabc Documentation" for installation instructions for a postscript viewer and configuration hints. For Windows 7/8 get the binary installer flabc-setup-w64.exe, which includes 64bit binaries of flabc (version 1.1.2) and abctab2ps (version 1.8.12), the abctab2ps user's guide and abc2midi (version 1.49). Note that you will need additionally both ghostscript and gsview. After installation you can open abc files with the command flabc. The documentation is installed into /usr/share/doc/abctab2ps and /usr/share/doc/flabc and is also accessible from the "Help" menu in flabc. If you want to use midi conversion you will additionally need abc2midi. The easiest way to install abc2midi on Linux is by getting its source code from the abc2midi home page. If the above binaries do not suit your needs or you want to hack on abctab2ps and flabc yourself you can get the source code: abctab2ps-1.8.12.tar.gz and flabc-1.1.2.tar.gz. For an installation unpack the sources with tar xvzf ... and follow the instructions in the file README. (Version 1.6.2) An abc language mode for the editor Emacs. Apart from various Unix platforms, Emacs is also available for Win32. By default Emacs has rather strange keymappings; the common CUA keymappings can be enabled with cua-mode.el. This mode only works with GNU Emacs and not with Xemacs. 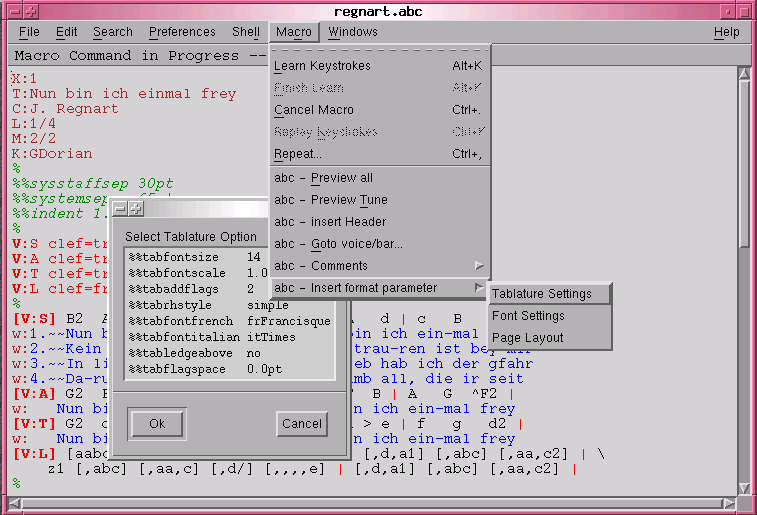 (Version 1.4) An abc language mode for the Unix editor Nedit. Adds syntax highlighting and menu entries for previewing abc files, automatic cursor motion to errors and interactive selection of format parameters. Here is a screenshot. 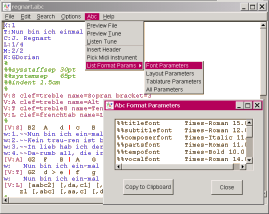 abcEditor A Windows-GUI for abctab2ps and abc2midi that also offers tablature to music conversion (which flabc does not support). For more information, please contact Werner von Hörsten by email: wvhoersten (at) hotmail (dot) de. (Version 1.0) A Python script to postprocess the abctab2ps output for encoding esperonto special characters (ĉ, ĝ, ĥ, ĵ, ŝ, ŭ) to latin3 encoding in postscript. (Version 1.5) A Perl script (requires Perl version 5.0 or higher) for the extraction of voices, movements etc. from abc-files. Output can be piped directly into abctab2ps. A man page is included. If you do not have Perl on Windows, download abcselect-win32.zip instead. (Version 1.5) A simple Perl script for adding page numbers to a postscript file. Position and start number can be changed by command line options. pspage -? gives a usage message. If you do not have Perl on Windows, download pspage.exe.gz (old version) instead. (Version 1.8) A Perl script which converts from Wayne Cripps' "tab" format to abc. Detailed documentation is included. If you do not have Perl on Windows, download tab2abc-win32.zip (Version 1.6) instead. Jef Moine's version abcm2ps with up to two independent voices per staff is available from http://moinejf.free.fr/. From the same site, a useful Perl script for transposing abc files, abctranspose.pl by Matthew J. Fisher, is available. Ghostscript is a postscript interpreter and converter into almost all printer languages. On MacOS X you cannot use Preview for viewing the Postscript files generated by abctab2ps because it does not seem to support type 3 fonts. Thus you will need to install Ghostscript/Ghostview, preferably from Fink (packages ghostscript and gv). These are X11 applications so that you need additionally Apple's port of X11. PSUtils is a collection of handy tools for manipulating Postscript files, like page extraction, resizing (eg. letter -> A4), page reordering, n-up printing etc. psjoin is a very useful Perl script for concatenating PS files (such a tool is missing in PSUtils). A Postscript FAQ and links to documentation (including the official reference books) can be found on http://en.wikibooks.org/wiki/PostScript_FAQ. "christoph (dot) dalitz (at) hs-niederrhein (dot) de"